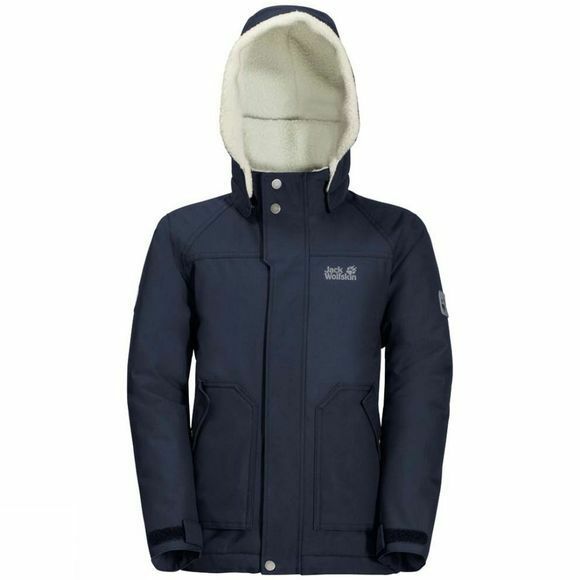 The Boys Great Bear Jacket from Jack Wolfskin a waterproof, warmly insulated winter jacket made for children who like things to be a little less exciting. Having said that, the hood is still pretty exciting. It can be folded flat or worn as a tunnel hood.Both the hood and the collar are fully lined with warm fleece. Under the jacket's wool-like weather protection fabric there's a thick layer of synthetic fibre insulation. The sleeves are equipped with additional internal cuffs. They fit snugly around the wrist, and keep out the cold, wind, rain and snow.